Meg Whitman, president and CEO at HP, is committing the company to three years of research and development to re-establish HP as a technology-focused hardware company. The focus on three years of R&D follows the turmoil last year over the company's PC strategy, leading to Meg Whitman's appointment as CEO. Speaking in Shanghai, she said HPs strategy is focused on hardware, which represents 70% of the company's revenue. Software is the second area of the business. 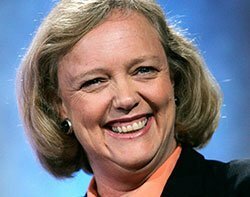 But in spite of HP's £7bn acquisition of Autonomy in August 2011, Whitman said: "We will not transform HP into a software company." Whitman said HP's software supports the hardware business, while its services division – built from the £7.13bn acquisition of EDS in 2008 – will be used to support HP products. "Our software enables us to manage and secure heterogeneous infrastructure. HP Services is critical to our future to wrap our products together," said Whitman. She said HP increased R&D spending in 2012, adding: "We will do so again in 2013 and 2014. We are creating the commitment and financial capability to invest in R&D." HP is looking closely at budgets to ensure it can continue to invest in its core products areas of PCs, servers, storage and networking. Whitman said: "We are doubling our innovation efforts in storage and networking for better performance and easier to manage converged infrastructures. "We have to look at how we spend money and everything is on the table." Whitman said she joined HP during a troubled time, following an announcement by the former CEO, Leo Apotheker last year to sell off the PC business. She said: "PCs are an essential part of HP. We want to make it easier for customers to deal with HP and we looked at every business process." This has led to the recent change where the printing and PC businesses were combined. "We have confirmed our commitment to products, but this a journey, and it will take time to restore the HP business," said Whitman.